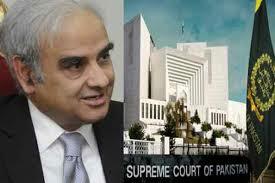 Chief Justice of Pakistan Nasirul Mulk on Tuesday said that the judicial commission has not been mandated to assess allegations of election rigging in every constituency individually, adding that the commission is only reviewing the allegations of rigging in the general election as a whole. The CJP has summoned a session in his chambers today (Wednesday) regarding the procedure of obtaining Form 15. According to details, PTI’s attorney Abdul Hafiz Pirzada and Balochistan National Party’s lawyer Shah Khawar argued with former Balochistan election commissioner Syed Sultan. Pirzada asked why 8 per cent additional ballot papers were published when only 4 per cent are allowed to which Sultan replied he understands the technical matters more. He said the constituencies that have more statistical blocks publish more ballot papers and that the electoral material was received by the returning officers in army’s supervision. The former Balochistan EC said that tribunals have concluded election related complaints and that general elections and local bodies elections were held in the province under ‘unfavourable’ conditions and that one person also passed away in the process. After the arguments, the CJ said that it is not the mandate of the judicial commission to individually review allegations in every constituency. Justice Amir Hani Muslim said that if result of any constituency was challenged in the tribunal then this has nothing to do with the enquiry commission. The chief justice adjourned the hearing until Thursday.